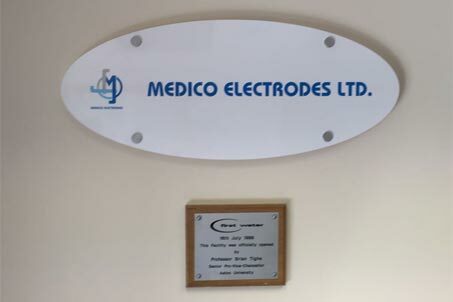 MEDICO ELECTRODES INTERNATIONAL LTD is one of the leading manufacturers of Disposable ECG Electrodes for all cardiac monitoring and diagnostic procedures. The manufacturing was started by the company in the year 2002. Due to a consistent high quality of the Products, their demand grew manifolds in a short span of time. This necessitated growth of the company and augmentation of its manufacturing facilities.In 2006 a new state-of-the-art electrode manufacturing facility with enhanced capacity was set-up in Noida SEZ. Our practice of using the best raw materials and maintaining highest quality control standards in manufacturing combined with our special Gel formulations, allow us to provide the best possible interface between patient and machine. MEDICO has been accredited with ISO 13485 and US FDA Registration. All our products have CE mark and they meet or exceed ANSI / AAMI EC12:2000 standards on Disposable ECG Electrodes. For the past five years in a row, we have been awarded the highest CRISIL rating in our industry category which is an indication of the company’s financial robustness. The present rating is SME1 in the Small & Medium Enterprise category. Over the years, the company has bagged many renowned national & international clients. As on date, we are supplying electrodes to over 35 countries apart from India. These include Europe,USA, Latin America, Asia, Australia, Middle East(Gulf) and African nations. The emphasis is on development of new products and meeting the market requirements for different Countries. The Company specializes in supplying products in their standard Medico Brand & also in private labelling / OEM Brands. The ability to supply consistently high quality electrodes at competitive prices makes the company a “preferred OEM supplier” to several reputed International Brands.Thanks to the consistent growth, today Medico is perhaps the third largest manufacturer of Disposable Centre Snap Electrodes in the world and the biggest outside the USA. With a constant endeavour to grow in 2015,the company acquired 100% shares in Ambu White Sensors Ltd., a UK based manufacturer of Tab Electrodes, Electrosurgical Plates and Hydrogel from Ambu A/s, with their head-office in Denmark. The Acquisition consisted of two manufacturing plants in Warwick, UK,thus providing a multi-national base to the company. The Hydrogel plant with the latest Technology and technical expertise will open up un-imaginable avenues beyond the growth of existing business; as the gel technology today is used not only in the production of Biomedical Electrodes but also finds its usage in several new areas like Wound care, Defibrillation Pads, TENS Electrodes & drug delivery applications. More so the facility will support our desire to control the entire value chain from the high quality gel component to the low cost manufacturing operations. Solid Gel Electrodes – Foam/Cloth/Tape with Stainless Steel Studs or Radio Translucent and with optional fitting of 4mm Banana adapter. Liquid Gel Electrodes – Foam/Cloth/Tape with Stainless Steel Studs or Radio Translucent. Prewired Neonatal Electrodes – Foam/Cloth/Tape with Copper or Radio Translucent wires. These are Engineered for High Quality ECG Traces. They use skin Friendly conductive adhesive Hydrogel and manufactured in different sizes to match patients’ requirements. Radiolucent in nature, the TAB Electrodes meet or exceed AAMI Standards. These use skin friendly soft conductive adhesive Hydrogel designed to improve the contact quality thus ensuring a very low heat build-up on the skin. Available in Split and Non-Split models, with or without pre-attached cable. Universal sizes offer the benefits of reduced inventory holding by the users/hospitals. Transcutaneous Electrodes for Nerve Stimulation are Non-Invasive analgesic Electrodes, used to relieve nociceptive, neuropathic & musculoskeletal pain. Hydrogels – A range of conductive adhesive gels for use in the production of ECG Electrodes, Electrosurgical Plates, TENS and Pre-Wired Electrodes. These gels are also used in a wide variety of medical applications, like Wound care, Defibrillation Pads & Drug delivery applications, which opens up new avenues for usage and enormous potential for growth. In 2016 the company was awarded the prestigious INDIA SME 100 Award (selected from over 46,000 entries) in recognition of its growth, competitiveness & production excellence. The same year, Mr Amit Mehra was conferred with the award titled ‘India’s Small Giants’, one of the 40 recipients in India, who started out with little or no capital and have gone on to create a legacy with their enduring entrepreneurial spirit & courage of conviction. International product quality, Development of new products, Competitive price and Excellent customer service – have been the pillars of strength for establishing the business credentials worldwide, which has taken the company’s turnover to about Rs.200 crore. At present, Medico has two manufacturing units in SEZ and one manufacturing plant in the UK. The Company today, commands a major share of the Indian market and has reached the enviable position of perhaps the third largest manufacturer of Disposable Centre Snap Electrodes in the world and the biggest outside the USA – marching towards being Number 1 by 2020. The company, presently exporting its products to 35 countries across the world in addition to India, is moving ahead towards its goal of selling 1.5 billion Electrodes annually by the year 2021. In short, Medico is a fine example of “Make in India” spirit propagated by our Honourable Prime Minister & we are proud of it.